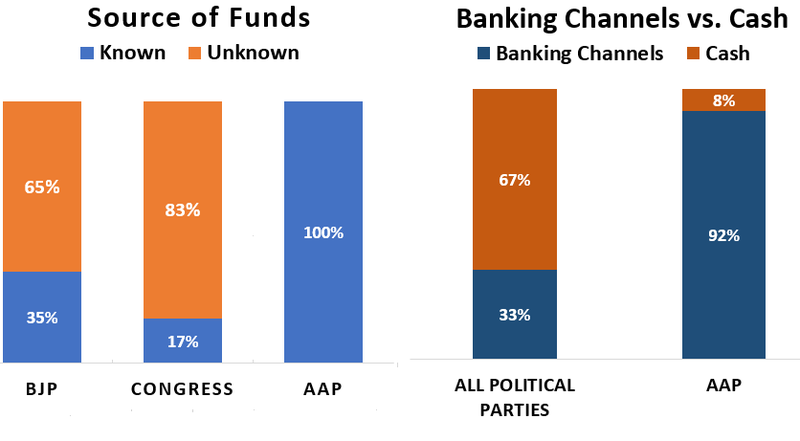 As per a study by Association of Democratic Reforms in 2017, only 30% of the funds received by all political parties in India are from known sources and 63% is received in cash. In case of AAP, all funds are received from known sources, with less than 8% in cash, which too is fully tracked and deposited into the bank. AAP realises that quid-pro-quo associated with ‘unknown sources’ is the primary cause of widespread corruption and marginalisation of the poor in government decision making. Ever since our inception in 2012, we have set the benchmark for transparency and probity in political funding in India. This movement to establish honest politics and pro-people governance is possible only with clean funding to meet its expenses and fuel its growth. Donate generously to help strengthen the movement to transform Indian politics. There are several options available for donation. This page enables you to register so that you can transfer funds via NEFT/RTGS directly from your bank account in India. Click here for donating online via national or international Credit Card/Debit Card or Net Banking (Indian Banks only) and Wallet. If you would like to pay via Cheque/DD, follow instructions on this page. NRI supporters with valid Indian passports can also donate via online remittance from a foreign bank by following online procedure here. Only Indian citizens can donate. Others can still contribute to this movement by volunteering for the party. Please note: You will not be able to pay through Citibank Netbanking or debit card.The limit to pay through ICICI Bank Netbanking is set at Rs 20,000/- by the bank. International netbanking are not allowed. For all other banks/ debit cards/ credit cards you should be able to complete the transaction smoothly. Do remember to keep your Login & transaction passwords handy. Also for two factor authentication you may need your mobile phone too. Fill this form to register so that you can transfer funds via NEFT/RTGS from your bank account in India. You'll get instructions by email. I declare that I am an Indian citizen, above 18 years of age and am making this contribution voluntarily from legally earned personal funds. I also permit Aam Aadmi Party to communicate with me using my phone and/or email specified above. The particulars and statements made above are correct to the best of my knowledge and nothing has been concealed or withheld. ICICI account holders can donate with their debit cards. ©2017 Aam Aadmi Party. All rights reserved.